The top pic shows almost all of the field marks for this stunning bird: black tail including vent area; black hood, wings and back; yellowish orange underparts. It's yellowish orange lower back is not visible. 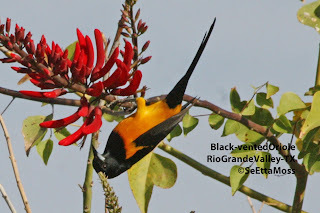 This is the first of several clips of a Black-vented Oriole, a very rare Mexican vagrant, that is foraging on the beautiful tubular flowers of a coral bean tree in Bentsen Palm Village RV Park. 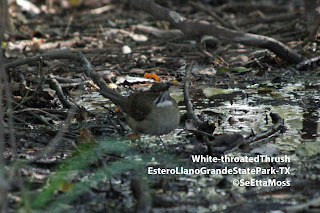 It was first spotted on Dec 13, 2010 in Bentsen State Park which is only a few hundred yards from it's current location. These warblers were pretty challenging to photograph as, in addition to the bright gray overcast sky, they are in almost constant motion and often engaged in chasing each other away from some juicy morsel. 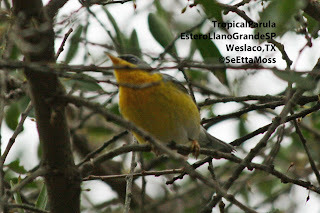 I was delighted to see and photograph this apparently overwintering Tropical Parula today. 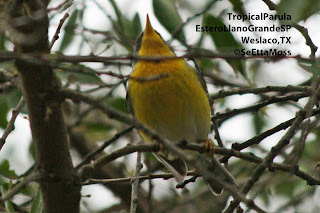 It has been reported for several days foraging in a mixed flock of warblers and Ruby-crowned Kinglets traveling in the former rv park area of Estero Llano Grande State Park in Weslaco, TX and that is where I photographed it.